Even though the display record length is shorter than the specified record length, measurement is made over the full record length. 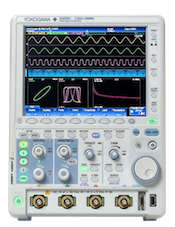 There is no function that allows you to move the display position to view the other parts of the waveform that is not displayed. When storing the measured data, the entire record length of data is stored. If you wish to view the entire record length, please use the Waveform Viewer or Xviewer. The entire record length of measured data can also be output when transferring the data over communications. For example, if the record length is set to 4 Mpoints, the displayed record length is also 4 Mpoints until the T/DIV is set to 2 mS/div. When the T/div setting is set to 1 mS/div, the display record length becomes 2 Mpoints and the rest of the waveform (2 Mpoints) does not display on the instrument. However, measurements are made for 4 MW of data and is stored. The entire 4 Mpoints of data can be retrieved using the Viewer Software.